Nishi Enterprise is a one stop solutions provider when it comes to the designing and manufacturing of top grade Bearing Chock products for the local and international markets. We regularly produce Bearing Chocks that can deliver high performance with reliable regularity and efficiency. Our Bearing Chocks are used regularly in various industries and sectors like steel plants, rolling mills and other industries. By making use of top quality materials, we can create standard and customized products that can work perfectly for our clients. Our products are also designed to deliver optimum performance even in various high load working environments. Since we are regularly designing Bearing Chokes for roller flour mills, steel re-rolling mills and various other types of milling industries, you can be sure of the fact that our products are completely reliable and capable of delivering time tested performance. You can also greatly enhance your production levels with our Bearing Chokes. Our Bearing Chocks are notable for their superior dimensional precision, high quality structure and performance as well as accurate finish. We make use of a wide range of materials to create our Bearing Chocks, such as aluminum, steel, iron, zinc, brass and alloy. Here at our official workshop, we make use of cutting edge technology to design and manufacture high class Bearing Chocks that find extensive use in the local and international markets. 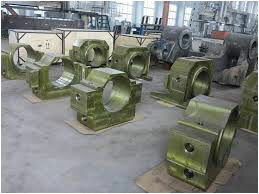 Since we only make use of the finest imported machines to handle different stages of production such as boring, lathe, milling, shaping and grinding finish, it makes it possible for us to create bearing chocks that deliver high end performance at all times. We make use of forged EN - 8 materials as well as MS Steel casting units that are known for their superior quality. This makes it possible for us to create products that perfectly match the bearing sizes. 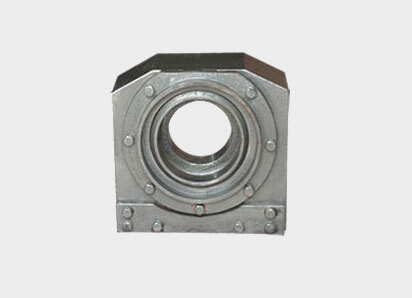 These bearing chocks come in diverse window sizes and have accessories made from best steel side covers, lumbering units, sleeves, products bolted with the finest alloy steel nuts and chick nuts that are readily available in various window sizes.